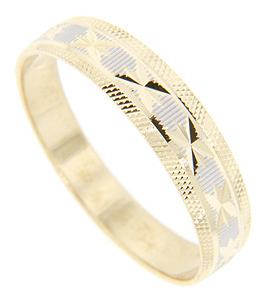 This 14K yellow gold estate wedding band uses a combination of etched straight lines to create complex patterning. A hint of white gold is seen in the center of the ring between the engraved six-pointed stars. The ring measures 5.5mm in width. Circa: 1980. Size: 9 1/4. We can resize.